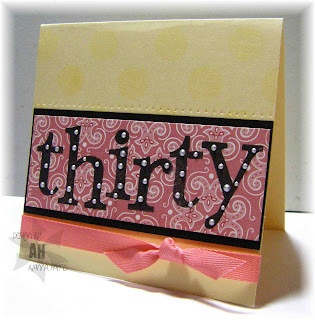 Silverline Designs: 30th birthday x 2! 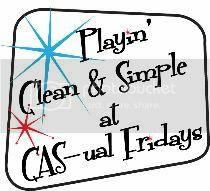 Two were for a birthday party we will be attending this weekend...DH's cousin and his wife are both turning 30. 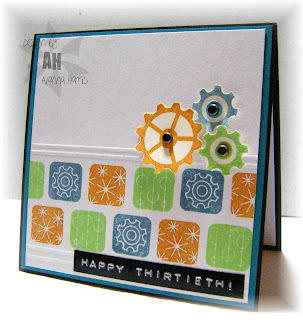 I stamped the alpha directly on the madeira paper and added a dot of liquid pearls to each polka dot. The card looks soooo elegant IRL. This stamp set rocks for boys...I will be getting a lot of use out of it for sure! I made double score lines on my card, leaving enough room in between for two rows of the rounded square stamps from the set. I initially tried to line them up using my SAMJ (which I love for perfect positioning), but it really didn't work out in this case. I had much better luck just eyeballing! The gear stamps were cut out, and with the two small gears, I added a 1/4" circle of the same colour under the brad (I thought there was too much white space inside the gear otherwise!). I suppose if it hadn't been midnight, I could have rigged it so the gear actually spin...that would be too cool! The liquid pearls are a beutiful touch!